Carrying on with work life can be a hassle when pregnant. For most expectant women, the need to make some adjustments to help them cope when working is inevitable. Below are some of the few changes they have to make so that they can be comfortable at work. In as much as your pregnancy may have you in foul moods, try your best not to get stressed over everything. Stress will only do more harm and good. Try doing things such as yoga, meditation, or jamming to your favorite tunes; they will help you be in better moods. Eat meals in small portions where you do around five to six small meals instead of three large ones. Above all, ensure that you stick to a healthy diet that supplies you with proteins, carbohydrates, and minerals such as calcium. Enjoy snacks but not those that strain the digestive system. Such a dietary adjustment prevents issues of heartburn and indigestion as well as other related complication that tend to come during a pregnancy. Your favorite dresses will not fit, and you soon find yourself running short of choices. As the pregnancy progresses, you should start investing in maternity wear, and this includes the appropriate lingerie. What you pick should not only accentuate your looks but should also be breathable to help you cope with the increased body temperature. Moreover, you still can manage to rock that chic look by accessorizing. The change in the wardrobe will help you feel comfortable and boost self-confidence. Expect your feet to swell and some uncomfortable back aches as well as occasions where you lose your balance when pregnant. Much of this happens during the last trimester and hence the need to ditch those fancy heels and opt for flat shoes that are soft, breathable and offer plenty of comforts as you go about the day’s work. These xelero shoes could do the trick. You should strive to keep your energy reserves by eating healthy to keep those energy blues that come and go during pregnancy at bay. The drop in energy is because the body is working overtime to support the little one developing in the womb. Your meals should be having plenty of proteins and vitamins with the body converts into energy. Avoid giving into your sugary cravings for things such as donuts, cakes, chips, and colas and opt for nutrient-rich snacks. Feeling sleeping is not uncommon when you are pregnant. It tends to happen a lot during the first trimester, and it is attributed to the changes taking place within as the body preps for the new life. To beat the drowsiness, take a short break and go for a walk along the corridor or chat with a workmate. Also, remember to take healthy drinks that keep your energy levels up; do avoid caffeinated beverages or limit them to less than 200mg per day. Taking a break from work now and then during the course of the day is good for your body. Taking a walk when on your brakes encourages the flow of blood keeping it from clotting and causing the feet to swell. It also keeps you be in better moods, keeps your energy levels up, and helps you feel refreshed. Some days may have you disliking almost everything, but this is mostly the body feeling a bit off due to the pregnancy, and there is little you can do trying to go against the will of your body. The most natural thing to do is to accept that you are pushed to the wall and need to rest. Taking a day off during such days will do you good. It is important to stay hydrated during your pregnancy. For this, you should take plenty of pure, clean water instead of the flavored drinks. If you are for such, then consider making homemade lemonades and power drinks. The objective is to avoid getting dehydrating especially during your last months of the pregnancy to prevent serious complications. Sitting on a stool can help you feel more comfortable when seated. It has you in an ideal sitting posture and lessens the pressure exerted on your legs and feet. 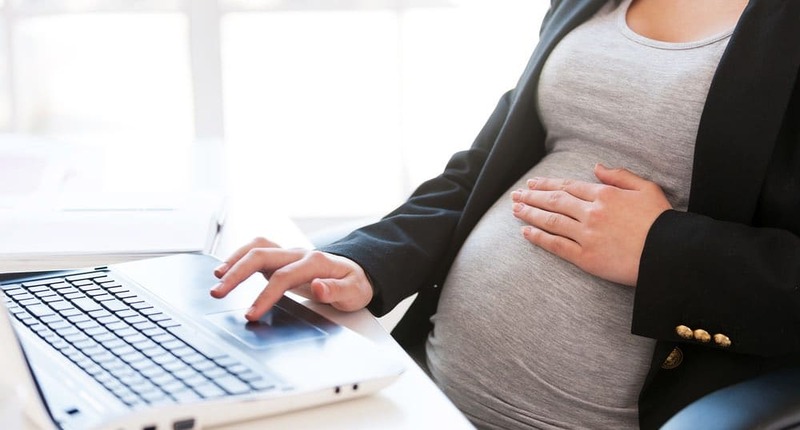 Speaking of an increase in body temperature, the work in a crowded workplace when pregnant can be a hot nightmare. Thus, investing in a small table fan is a brilliant idea. It will help you feel cool and thus aiding in ensuring you do not lose your concentration when you are at your desk. Invest in a portable fan with rechargeable batteries and support for direct power. The body is working overtime to support you and the baby developing in your womb; therefore, it will need to refuel frequently. As such, you should ensure you have enough reserves at your desk. Also, you should ensure you have essential supplies such as antacid, cold cream, itchy lotion, wet wipes, serviette, and mouthwash among other things that make you feel a bit better when working.